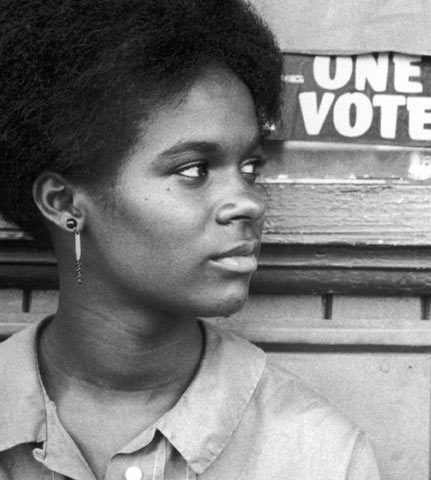 During the last Presidential election cycle, black women had the highest voter turnout rate of all voters in the United States between ages 18 and 29. According to the Center for American Progress, black women were instrumental to President Obama's re-election, voting at a higher rate than any other racial, ethnic, or gender group. A recent poll conducted by Essence and the Black Women's Roundtable (BWR) shows that black women are one of the strongest voting blocs in the country. Despite their influence at the polls, black women's concerns are undervalued in contemporary political campaigns. While some presidential candidates have gone to great lengths to court black voters, few have been vocal about black women's vulnerability to state-sanctioned violence. When a young black girl was assaulted at Spring Valley High School in Columbia, South Carolina a few weeks ago, many presidential candidates, on both sides of the aisle, looked the other way. The fact that a black girl was aggressively tossed as a rag doll by a police officer in the classroom -- over the use of her cellphone no less -- underscores the pervasive nature of violence against black women at the hands of law enforcement officials. Few presidential candidates were willing to publicly denounce the officer's use of excessive force or even acknowledge the disproportionate rate of physical aggression and unfair targeting aimed at black girls in the classroom. According to a recent report by the African American Policy Forum (AAPF), black girls are six times more likely to be suspended or expelled than their white counterparts for the most trivial "offenses." In 2012, one black girl in a Georgia middle-school faced expulsion and criminal charges simply for writing "hi" on a locker room wall. In 2013, another black girl in Orlando, Florida, was threatened with expulsion for failing to change her natural hairstyle. In an unprecedented political move, presidential hopeful Senator Bernie Sanders made mention of Sandra Bland's suspicious death during the most recent democratic debate. While symbolic and meaningful, Sanders's reference to Bland barely scratched the surface of the issue. What Sanders and other candidates failed to address is that black women are subjected to police brutality and mistreatment at alarming rates and this has been the case for decades. On March 31, 1925, a black woman in Lexington, Kentucky died in police custody after being falsely arrested for public intoxication. By the time local police officials concluded that she was not drunk but had been suffering from a severe attack of indigestion, it was too late. While organizing in Mississippi during the early 1960s, civil rights activist Fannie Lou Hamer was arrested and brutally beaten by local police officers in her cell. By one account, Hamer had been beaten so badly her entire body was swollen and black and blue. Years later, on June 22, 1979, Bonita Carter, a 20-year-old black woman from Alabama, died at the hands of Birmingham police when they mistakenly assumed she was involved in a store robbery. In 1984, Eleanor Bumpurs, a 66-year-old black woman in the Bronx, was shot and killed by New York City Police while resisting eviction from her apartment. In 1999, Margaret LaVerne Mitchell, a 54-year-old homeless black woman, was shot in the back by an officer on the streets of Los Angeles where she resided. And sadly, the list goes on. While the exact figures are unclear, the AAPF acknowledges that there has been a rise in the number of black women dying as a result of police shootings. There is no denying that black men die in police custody at disproportionately higher rates than their female counterparts. However, the increasing number of black women who are dying on account of state violence should equally concern us. The tragic stories of Janisha Fonville, Miriam Carey and Yvette Smith are but a few examples of unarmed black women who have died at the hands of police within the last three years. Naturally, many black women voters are concerned about these issues and desire to elect officials who value their concerns. In addition to advocating police and education reform, the recent BWR poll reveals that black women voters are taking an active interest in several key issues including criminal justice reform, affordable healthcare, and the minimum wage. The poll also reveals that black women have no intention of letting up at the polls. According to Vanessa DeLuca, editor-in-chief of Essence, "Black women will continue to have strong voter turnout numbers and perhaps lead the nation as they have done in the last two Presidential elections." Therefore, when presidential candidates are making passionate appeals to various demographic groups during this election season, black women should be a top priority. Candidates who ignore black women voters do so at their own peril.